If you randomly heard a title like “Is It Wrong to Try to Pick Up Girls in a Dungeon? ,” you’d probably expect to be in for an anime filled with fanservice and nothing but. Yet, while there is some degree of it in this one, it’s never really the focus of the show. In fact, this anime never even answers its title’s own question. Is It Wrong to Try to Pick Up Girls in a Dungeon? is the story of Bell, a newbie adventurer who has come to the big city to enter its famous dungeon. To battle the monsters within, he has become a disciple of Hestia, a down-on-her-luck goddess who grants him the power to level up along with learning skills and magic. Despite the title, Is It Wrong to Try to Pick Up Girls in a Dungeon? is actually more about the opposite phenomenon. As a child, Bell’s grandfather raised him on stories of saving a defenseless girl in the dungeon and falling in love. In Bell’s case the roles are reversed: It is he who is saved by a seasoned adventurer, Aiz Wallenstein. Lovestruck and embarrassed at needing to be saved, Bell vows to become as strong as Aiz and confess his love to her as equals. 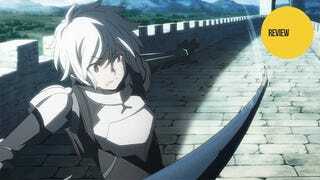 Most of the personal drama in Is It Wrong to Try to Pick Up Girls in a Dungeon? is due to Bell’s own insecurities. While Aiz seems to care little if a man is strong or not when it comes to picking a romantic partner, Bell is sure she must—though, in his defense, he is far from the only one to hold this mistaken belief. Bell’s inferiority complex is the central facet of his character. It is also the source of his power—quite literally in this case. Bell’s first skill allows him to level up far quicker than normal if he stays passionately fixated on a goal. Hestia not only hides this from him but also downplays his growth as much as possible—which in turn causes him to try even harder to catch up with Aiz. The other aspect that drives Bell is his kindhearted nature. He is one of those people that truly believes the best in others—even when they give him every reason not to. This kind of optimism, combined with his inferiority complex and ceaseless drive to try harder, causes him to be brave and heroic—believing this to be the only way to achieve his seemingly impossible goal of becoming Aiz’s equal. The other characters, while rarely as deep, are likewise entertaining. Hestia is head-over-heals for Bell—who of course could never even fathom the idea of a goddess being in love with him. But while quick to anger and jealous to a fault, she is willing to put her money where her mouth is when it comes to supporting Bell—even if that means debasing herself to the point of taking part-time jobs. Through her, we also get a peek into the society of gods and why they are willing to sponsor heroes—bragging rights, mainly. Aiz, on the other hand, is mostly a mystery. Calm and cool headed—to the point of seeming emotionless—she is obviously interested in Bell (though whether romantically or not it’s hard to tell). It is clear, however, that she cares little for what others expect of her. And while others are quick to write off Bell, she sees something great in him and gladly helps him bring it out. Aside from the characters, the world of Is It Wrong to Try to Pick Up Girls in a Dungeon? is the other interesting part of the show. While this is set in a Western fantasy world (specifically one with a Greek/Norse pantheon of gods), the structure of the world is akin to that of a MMORPG. The adventurers quite literally gain experience points killing monsters which in turn boosts their individual stats and levels them up. They even have their character sheets tattooed onto their respective backs. The monsters explode into dust when killed, dropping gems and items which are then used for crafting. More than that, the monsters, including bosses, are on a re-spawn timer—and the adventurers are aware of this. It all makes for a fantasy world that is easy for a gamer to understand. But, at the same time, it’s hard not to wonder how a world like this came about naturally within the context of the story. While the first half of the anime is mostly concerned with introducing the characters, world, and general driving conflict, Is It Wrong to Try to Pick Up Girls in a Dungeon? picks up speed in the back half of its run. Starting with Bell facing his first life-or-death challenge and then continuing on to his party’s adventure of being stranded in the depths of the dungeon, the story adds real stakes. While of course you know that Bell will make it out alive, the odds are so stacked against him that it becomes harder and harder to see how he’ll accomplish this. Unfortunately, the show has a built-in deus ex machina that cuts into the tension somewhat: Bell’s second skill. Called the Argonaut, this ability activates randomly whenever he acts heroically in a life-or-death situation. It basically gives him the ability to have one attack powered up so drastically, he can overcome any threat. That said, as he has little control over when it activates, it is not overused—but when the chips are down, it’s a good bet that Argonaut will come into play. Is It Wrong to Try to Pick Up Girls in a Dungeon? is a fun, if predictable, fantasy anime. The world it builds is familiar to anyone who’s played an MMORPG—or a table-top RPG for that matter. And to explore that world, it’s got an enjoyable main character and an extended cast that is simply fun to learn more about. Now if only it would answer the obvious question: Is It Wrong to Try to Pick Up Girls in a Dungeon? Is It Wrong to Try to Pick Up Girls in a Dungeon? aired on Tokyo MX in Japan and can be viewed for free and with English subtitles on Crunchyroll and Hulu.